The Dharma Drum’s Eight-Form Moving Meditation was developed by Master Sheng Yen of Dharma Drum Mountain as a means of allowing people living stressful and busy lifestyles to enjoy some of the benefits of Chan meditation. The system, based on many years of practice and personal experience, has incorporated the essence of Chan meditation into a series of simple physical exercises. In addition to physical exercise, practice of the Eight Forms helps you relax your body and mind, so that you can develop a healthy body and a balanced mind. Dharma Drum’s Eight-Form Moving Meditation is a set of easy-to-learn exercises that can be practiced almost anywhere and at anytime. This system of “meditation through motion” is beneficial to both body and mind, and once acquired through diligent practice, can be performed whether walking, standing, sitting or reclining, so that you are always mindful of being relaxed in body and mind. By practicing the Eight Forms, you will always be composed and at ease, and at every moment enjoy the bliss of meditation and the joy of the Dharma. Join your palms in front of your chest. Stand with your feet shoulder width apart. Join your palms again at the completion of each form. Relax your body and stand with your feet shoulder width apart, both arms hanging naturally at your side. Swing your arms naturally to the left and right, turning from the waist. Your feet should remain stationary. As your arms swing, follow through to pat your left shoulder with your right hand and your lower back with your left hand. Reverse this action as you turn and perform repeatedly. Be aware of your hands patting your shoulder and back. Be aware of how the movement of your waist causes your arms to swing. Be aware of the movement of the whole body. Be aware of your arms and waist becoming more relaxed. Be aware of your whole body becoming more relaxed. Enjoy the sensation of relaxation through your whole body. Join palms upon completion of this form. Slowly tilt your head to the left, bringing your ear as close as possible to your left shoulder. Be aware of the right side of the neck stretching. Slowly tilt your head to the right, bringing your ear as close as possible to your right shoulder. Be aware of the left side of the neck stretching. Slowly tilt your head to the left. Feel the stretching sensation of the right side of the neck. Be aware of your whole body becoming more relaxed. Slowly tilt your head to the right. Feel the stretching sensation of the left side of the neck. Be aware of your whole body becoming more relaxed. Slowly bring your head back to an upright position. Slowly turn your head towards the left as much as possible and then towards the right as much as possible. Be aware of the turning movement. Slowly turn your head towards the left as much as possible and then towards the right as much as possible. Be aware of your whole body becoming more relaxed. Slowly turn your head towards the left as much as possible and then towards the right as much as possible. Slowly tilt your head downwards, bringing your chin to your chest as much as possible. Be aware of the back of your neck stretching. Slowly tilt your head backwards. Be aware of the upward stretching of the jaw. Slowly tilt your head downwards. Note the stretching at the back of your neck. Be aware of your whole body becoming more relaxed. Slowly tilt your head backwards. Note the upward stretching of the jaw. Be aware of your whole body becoming more relaxed. Slowly return your head to an upright position. Relax your body and stand with your feet shoulder width apart. Place your hands on your waist, with the webbing between thumb and index finger facing downwards. Slowly rotate your hips from left to right. Be aware of the movement as you rotate your hips. Be aware of the movement of your whole body. Be aware of your waist becoming more relaxed. 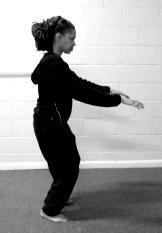 Rotate hips in the opposite direction, repeating steps 3 to 8. Lock your fingers and reach up slowly with both arms, palms upward, reaching as high as possible. Be aware of the sensation of stretching as your arms reach upward. Slowly lower both arms. Reach down slowly and try to touch the ground with your palms. Be aware of the sensation of stretching in your lower back and legs. Slowly reach up with both arms. Be aware of the sensation of stretching in both arms and through your whole body. Slowly reach down with both arms. Be aware of the sensation of stretching in your lower back and legs, and through your whole body. Slowly reach up with both arms. Be aware of your arms and then your whole body becoming more relaxed. Slowly reach down with both arms. Be aware of your lower back and legs and then your whole body becoming more relaxed. Repeat steps 6 and 7. Slowly reach up with both arms and enjoy the sensation of the whole body relaxing. Slowly reach down with both arms and enjoy the sensation of the whole body relaxing. Repeat steps 9 and 10. Resume an upright position. Join palms upon completion of this form. Stand with your feet shoulder width apart, both arms hanging naturally at your side. 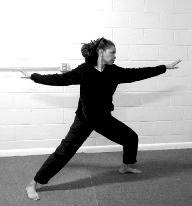 Swing both arms forward then backward, bending your knees naturally in unison with the swinging action of your arms. Repeat continuously. Be aware of the sensation of relaxation in the arms and knees, and then through your whole body. Enjoy the feeling of relaxation in the arms and knees, and then through your whole body. Slowly raise your arms, keeping them shoulder width apart, palms facing inward as if holding a ball. From left to right, slowly move your upper body and your arms in a circle. Be aware of the rotating movement of your waist. 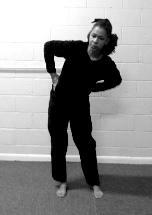 Be aware of how the movement of your waist drives the movement of your arms. Be aware of your waist and then your whole body becoming more relaxed. Enjoy the relaxing sensation through your whole body. Rotate in the opposite direction, repeating steps 4 to 9. Relax your body and stand with your feet together. Bend your knees and place your hands on your knees. Slowly rotate your knees from left to right. Be aware of the rotation of your knees. Be aware of the movements of your whole body. Be aware of your knees becoming more relaxed. Rotate in the opposite direction, repeating steps 4 to 8. Slowly step forward and sideways with the left leg, bending the knee. Keep the right leg straight. Stretch your left arm forward and the right arm backward. Slowly return to an upright position and join your palms. Slowly step forward and sideways with the right leg, bending the knee. Keep the left leg straight. Stretch your right arm forward and the left arm backward. Repeat Step 2. Be aware of the stretching sensation of both arms. Repeat Step 4. Be aware of the stretching sensation in your neck, legs and waist. Repeat Step 2. Be aware of the stretching sensation of both arms and then the stretching sensation through your whole body. Repeat Step 4. Be aware of the stretching sensation of your neck, legs and waist, and then the stretching sensation through your whole body (twice). Repeat Step 2. Be aware of both arms and then your whole body becoming more relaxed (2 times). Repeat Step 4. Be aware of your neck, legs and waist, and then your whole body, becoming more relaxed (twice). Repeat Step 2. Enjoy the relaxing sensation through your whole body. Repeat Step 4. Enjoy the relaxing sensation through your whole body. Join your palms and pause for a few seconds. The moving meditation is now completed.